Grants of up to $5000 (excluding GST) are available to community natural resources management groups for the development of small projects that promote the importance of natural resources. Grants of up to $10,000 will be considered where projects are a genuine collaboration between two or more organisations. Grants are for one year only and this year’s theme is ‘Reducing our carbon footprint’.They are not intended to fund core, on-ground natural resource management activities. Projects should be educational and of general interest, and should encourage people to become involved in natural resource management activities during World Environment Day on 5 June 2010. The Finalised Priority Assessment List (FPAL) for species, ecological communities and key threatening processes for the assessment period commencing 1 October 2009 is now available at http://www.environment.gov.au/biodiversity/threatened/pubs/priority-assessment-list-2009.pdf. In accordance with Section 194(G) of the EPBC Act, the Threatened Species Scientific Committee (the Committee) considered all nominations that satisfied the regulations, and prepared a Proposed Priority Assessment List (PPAL). The Minister established the FPAL after considering advice from the Committee. The nominations on the FPAL will be assessed by the Committee within the scheduled timeframe (see list), and the Minister will decide whether each species, ecological community or key threatening process warrants listing based on the Committee’s advice. Working individually and collectively botanic gardens are in a strong position to help address the primary conservation and development challenges of our time: biodiversity loss and climate change. This new two-week training course covers major present-day themes of practical conservation work at botanic gardens. It is designed to help representatives from the Asia Pacific region involved in botanic garden and arboretum management (in particular horticultural staff and mid-level managers) refresh their existing skills, understand global environmental policy, explore new ideas and engage with botanic garden experts from around the world. The course is run by BGCI, BGANZ and Singapore Botanic Gardens. The deadline for receipt of course and scholarship applications is 30 November 2009. For more information click here . "we need many tools in our arsenal to deal with the inevitable impacts, many of them negative, that climate change will bring. This book is one of those tools, and an incredibly important one. One of the important features of the book is its emphasis on the role of germplasm conservation, in all its forms, for conservation practice, both now and in the future. Ex-situ conservation will never take the place of good in-situ conservation practice, but aims to complement and enhance it, with the ultimate objective being to support the survival and continued evolution of species in self-sustaining populations in the wild. We won’t be able to save everything, but tools like these will give us a much better shot". The NSW Government is reviewing the State Plan. For more information and to have your say visit the Community Forum Page. Submissions open until Wednesday 16 September. The Minister for Climate Change and the Environment is seeking written submissions on the review of the Native Vegetation Act to determine whether the policy objectives of the Act remain valid and whether the terms of the Act remain appropriate for securing those objectives. At its last meeting, the Conference of Parties (COP) to the Convention on Biological Diversity requested that a revised and updated Global Strategy for Plant Conservation (GSPC) be developed going beyond 2010, taking into account current and emerging environmental challenges on plant diversity, within the broader context of and consistent with the new CBD Strategic Plan. In May 2009, the CBD Secretariat, together with the Global Partnership for Plant Conservation (GPPC) organized a GSPC Liaison Group Meeting, which was hosted in Dublin by the National Botanic Gardens of Ireland. At this meeting a first draft of a revised GSPC, including an update of the current targets for the period 2010-2020, was developed. The revised GSPC is now available on the CBD website for peer review, and can be accessed at: www.cbd.int/gspc/gspcreview. Comments are invited until 1st October 2009. The BGANZ (Botanic Gardens Australia and New Zealand) Congress hosted by Mackay Regional Botanic Gardens aims to recognize the role and responsibilities of Botanic Gardens as a resource for the future preservation of species, and to support the global effort to retain significant and regionally important plant materials. A series of guest speakers, workshops, keynote presentations and discussion groups will explore these issues.The Congress is expected to attract 200 people from across Australia, New Zealand and further afield. Registrations close 30 September. Australasian Plant Conservation is a forum for information exchange for all those involved in plant conservation. Each edition contains a range of articles on plant conservation issues which reflect the interests of the range of ANPC's membership. Regular features include lists of the latest relevant publications, websites, conferences, field work and workshops. It is currently received by more than 700 individuals and organisations within Australia and worldwide. Launch, Friday 4 September, 2009 at the Native Seed Forum, Royal Botanic Gardens, Melbourne. In 1997 the ANPC produced the 'Germplasm conservation guidelines for Australia - an introduction to the principles and practices for seed and germplasm banking of Australian species'. Given the advances in germplasm conservation over the past decade and a call to document these, the ANPC recognised the need to update the guidelines. In partnership with AuSCaR, the ANPC has produced 'Plant Germplasm Conservation in Australia, strategies and guidelines for developing, managing and utilising ex situ collections' (2009). The new publication provides up-dated guidelines and standards for the capture, storage and use of wild plant germplasm for long-term conservation in Australia, including the recovery of threatened plant species and the conservation of genetic diversity in the face of climate change. The guidelines will also be useful for shorter-term projects in the restoration and revegetation industry and community sectors. Published by Ballarat Region Treegrowers, Recreating the Country challenges landholders and land managers to consider new ways of thinking about how we might reverse the inexorable decline and disappearance of Australian plants and animals from rural landscapes. While integrating conservation and production has become the catchcry from foresters to dairy farmers, what can be done practically? This book provides the ‘stretch goals’ and the blueprint for ways of adding habitat and designing more wildlife-friendly properties. It’s set to become the bible for a new form of revegetation – the biorich plantation. Integrated with other forms of vegetation, these plantings would aim to enrich habitat potential across rural landscapes, not just for a lifetime, but in perpetuity. The book can be purchased for $20 and $5 postage, visit the Australian Forest Growers website. In June the Australian Government announced that the national network of local Landcare coordinators will continue. A total of $33.6 million funding is committed over four years to this project under the Caring for our Country Program. Minister for Agriculture, Fisheries and Forestry, Mr Tony Burke said, 'the decision followed extensive discussions with local Landcare groups and strong representations from a number of MPs'. From next year as a result of this up to 56 Landcare coordinator positions will be funded across Australia. May 18th is Plant Conservation Day - a global celebration, dedicated to preserving, protecting, and conserving plants for people and the planet. On the Plant Conservation Day website www.plantconservationday.org you can find all sorts of information about plant conservation and Plant Conservation Day celebrations. Check out the 'Learn More' section to find out why plants are so important, why they need to be conserved, and learn what you can do to help. The Rabbitscan Challenge is to record data about rabbits from at least 5000 sites across Australia that have rabbits (e.g. rabbits seen, evidence of rabbit dung and warrens identified) during May 2009. Your help is needed to find and record the data. So far over 1500 people have registered and almost 850 surveys have been conducted using the RabbitScan Google Maps data capture tool - multiple sites are welcome to give a more accurate understanding of the presence or absence of rabbits and their impacts on your landscapes. Landholders, Council Officers, Landcare group members, Regional Body bodies anyone who knows where rabbits live, should record all the rabbit spots in your district. More records are needed for rural areas as much of the data so far has come from urban areas. More than 600 native species are described and photographed in this guide to the plants of the Capricorn Region of Central Queensland: trees, shrubs, mistletoes, vines, grasses, sedges, orchids, and other herbaceous species. Included are keys to species in each genus and human usage and ecological notes. Rhonda Melzer is a Plant Ecologist and Botanist employed as Principal Conservation Officer at Qld Parks and Wildlife Service, Rockhampton. Joel Plumb is a retired School Principal, well known local naturalist and photographer, and past president of the Rockhampton branch of the Society for Growing Australian Plants. To order a copy of 'Plants of Capricornia' visit the Capricorn Conservation Council website. Did you miss the ANPC Second National Forum Minding our own biodiversity: Conservation on private land, which was held on 30 April - 1 May? Don't despair, because ANPC members will still be able to read the papers from the Forum in the June-August 2009 issue of the ANPC Bulletin Australasian Plant Conservation. If you're not yet an ANPC member, click here to find out how to join. Membership is for a calendar year - if you join during the year you'll get all four copies of Australasian Plant Conservation for the calendar year as well as immediate access to the other ANPC benefits including discounted conference and workshop registration. The Australian Government Department of the Environment, Water, Heritage & the Arts and the Threatened Species Scientific Committee are currently assessing a nomination to uplist the Cumberland Plain Woodlands ecological community from endangered to critically endangered under the Australian Government’s Environment Protection and Biodiversity Conservation Act 1999. Further work is required before the Threatened Species Scientific Committee is in a position to provide the Minister with sound scientific advice on whether or not the ecological community qualifies for uplisting under the Act. The nomination is currently available for public comment. The Department welcomes views from experts, stakeholders and the wider community on the nomination to further inform its nomination assessment process. The public comment period closes on 18 May 2009. Large and increasing efforts are being made to rectify the enormous negative landscape transformations that have occurred in both Australia and New Zealand (Australasia) over the last 200 years. The Global Restoration Network (GRN) has compiled a 'Top 25' list from a recent search for the most outstanding restoration projects in Australia and New Zealand. The aim was to highlight projects that might inspire and encourage restorationists throughout Australasia and elsewhere across the globe. Included in the list (no. 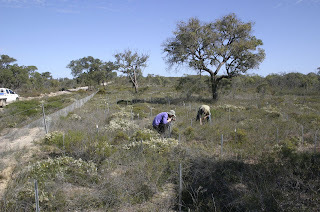 14) is the Greening Australia Restoring Grassy Groundcover project led by ANPC Committee member Dr. Paul Gibson Roy. The Society for Ecological Restoration (SER) International meetings provide an essential international forum for scientists and practitioners who look to restoration as a means to conserve the planet’s dwindling biodiversity and failing ecosystems. These meetings provide a critical platform to assist us in defining the principles of restoration, understanding goals and milestones, debating what ecosystem functions to measure and closing the gap between the science of restoration ecology and the practise of ecological restoration. With a focus on Making Change in a Changing World, the local conference organising committee hope to engage the debate on the impact of a changing world on our restoration capabilities. With this focus, SER International 2009 aims to accommodate as many interests as possible. The meeting will host an array of themes representing current research and global restoration practice. Themes that are relevant, of high focus and contemporary in Australia will also be part of the SER International 2009 program. INTECOL (the International Association for Ecology) holds international meetings every four years. An INTECOL meeting is the major forum for the global community of ecological scientists and practitioners. The tenth INTECOL meeting in Brisbane in 2009 has a theme of Ecology in a Changing Climate, Two Hemispheres, One Globe. Ecologists from around the world will explore how global climate change has impacted, and will further impact, ecosystems and their vital services to human communities. They will explore unique features of ecosystems in the southern and northern hemispheres but look for common elements in a search for solutions to this looming problem. Symposia will represent all scales of ecology from individual organisms to landscapes, and report on a diversity of ecosystems from marine to freshwater aquatic systems and terrestrial ecosystems from arid to rainforest and from polar to tropical. The meeting will bring expert ecological commentary on a range of vital processes including land and water use, sea level change, restoration of ecosystems, biotic invasions, changing water patterns, urban ecology and fire ecology. It will include discussions on long term monitoring of ecosystems, on incorporating ecological knowledge into policy, on integrating indigenous knowledge into conventional science, and on communicating ecological information to a broader community. While the meeting will attract an international attendance the ecological research of the two host countries, New Zealand and Australia will be on display, and visiting delegates will have the opportunity to appreciate both the unique biotas of these two countries and the strong basic and applied research effort applied to regional ecological issues that could be translated to other regions. Riparian corridors are particularly susceptible to weed invasion and are often invaded by multiple weed species. This susceptibility to invasion is a result of the natural disturbance processes associated with flooding, favourable environmental conditions and the continued input of weed propagules from upstream and adjacent areas. The impacts of human activities have also increased the likelihood of weeds establishing in riparian areas. However, well designed weed management programs can achieve positive outcomes in riparian areas. The CRC for Australian Weed Management Habitat Management Guide, Weed management in riparian areas: south eastern Australia is designed to provide assistance to managers of riparian areas in planning their weed management programs, and in so doing, highlight some of the challenges inherent in riparian weed management. Background material is provided about riparian areas and the weed species typically found in riparian areas in south-eastern Australia, particularly Victoria. The steps required to develop an effective riparian weed management program are described. These steps outline general principles but do not provide management prescriptions for individual weed species or riparian sites. While complementing other recent weed management guidelines, the information in this document highlights the central role played by water flow, particularly flooding, in shaping riparian areas and their weed management. Weeds in rainforest habitats have traditionally been considered as impacting only around edges and in highly disturbed areas. However more recently managers and researchers have discovered rainforest weeds can often occur in relatively intact rainforest habitat, greatly altering native community structure. Weed invasion is now becoming a major issue in the management and conservation of tropical forests. A species-by-species approach to management becomes more difficult and costly with each new introduction, particularly as biological, ecological and spatial information is often sparse. The logistical difficulties involved in detecting, controlling and eradicating weeds in rainforest habitats means that resources are not available to deal with each species individually. Rather, a range of strategies are necessary for management, including focused management of high-risk single species, strategies that target suites of species, and strategies that target entire landscapes. The CRC for Australian Weed Management Habitat Management Guide, Rainforests: Ecological management principles for strategic management of weeds in rainforest habitats focuses on the ecological processes that govern weed invasion in rainforest habitats and the ecological principles for strategically managing them so as to minimise weed introduction and spread. For further information visit the BRAIN 2009 Rainforest Workshops page of the BRAIN website. Van Klaphake (who has produced several botanical identification publications) is conducting workshops for some local councils in the Sydney region. Please note that there are costs for these courses and that you should contact the council staff members listed below if you would like to attend. BOOK REVIEWS: Would you like to do a review of one of the following recent CSIRO publications? If you would like to do a review of one of these volumes, please let APC Editor Rosemary Purdie (Rosemary.Purdie@environment.gov.au) know; just provide your name and a hard copy postal address. The person who does the review gets to keep the copy of the book. Please register for ANPC News updates! Welcome to the new ANPC News! Keeping up to date with the latest news about plant conservation is easy - just subscribe on the left of this page to receive email or RSS updates. By subscribing you will receive an update whenever news items are added to this web page, which will be approximately once every 1-3 weeks. Contributions are welcome - to find out how, scroll down to 'Contribute your news' on the left side of this page. Don’t miss this timely forum! Register NOW! Registrations close Friday 17 April. For further information, program, and registration visit ANPC Conferences. The Natural Resource Management Ministerial Council, on behalf of the Commonwealth and all state and territory governments, is inviting public comments on the draft Australia’s Biodiversity Conservation Strategy 2010–2020. The draft strategy is an important national policy document that will guide how governments, the community, industry and scientists manage and protect Australia’s plants, animals and ecosystems over the next ten years. Submissions are invited by Friday 27 May 2009 - for information on how to make a submission visit the Biodiversity National Strategy Review web page. Commencing from Monday 30 March, public information sessions are being held around Australia. The nomination to list the Inland Grey Box Woodland ecological community under the Australian Government's Environment Protection and Biodiversity Conservation (EPBC) Act 1999 is currently under assessment. As part of the assessment process a technical workshop was held in Wagga Wagga, New South Wales, in March 2008. The Australian Government welcomes views from experts, stakeholders and the wider community on the nomination and the technical workshop report to further inform its nomination assessment process. The public comment period closes on 21 April 2009. For further information visit Inland grey box woodland ecological community - Comments on nomination.